Questioning Software: Green Means Go? You certainly can quote as long as you owe the credits to Ben Simo. The video that you have taken as an example actually has nothing wrong in it - and I can say that sitting in India but probably I might have not said that if I were a North American or a European. The Indian swallows are allowed to carry a coconut as long as they disturb the traffic by dropping it on someone who pretends to follow the traffic rules. I learned from Rapid Testing training that it is important to break the rules and I was glad that I had been doing it all the while though not as conscious as I do now after the training. An automated traffic light system cannot control traffic in India neither can an unskilled traffic police. Here is an amazing co-incidence: While typing this comment there was a big SCREEECH sound and I looked outside the window - a common sight - a scooter had crashed into a car. So, to control the traffic not only a skilled traffic police is required but skilled drivers who have had and practice "discipline" from a long time. Especially in the normal-for-India example in the video, drivers need to look before they go. When the light turns green, there is a high chance that there will still be opposing traffic in the intersection. Only when the light is green and the intersection is clear is it safe to go -- although you may need to kind of push your way through or get run over. This kind of reminds me of waiting in line (or queue). In the US, we usually respect other's place in line. In other countries, I've discovered that waiting in line is an active activity. Each person needs to actively defend their place in line or they will lose it. 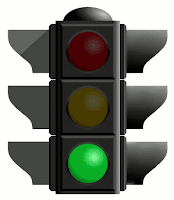 As we learn what things the traffic lights do not tell us, we can create heuristics to help us judge the situation. We can also enhance our tools and add tests (test cases, charters, examples -- whatever you call them and however you implement them) to check for things not presently covered by our traffic light setting algorithms.